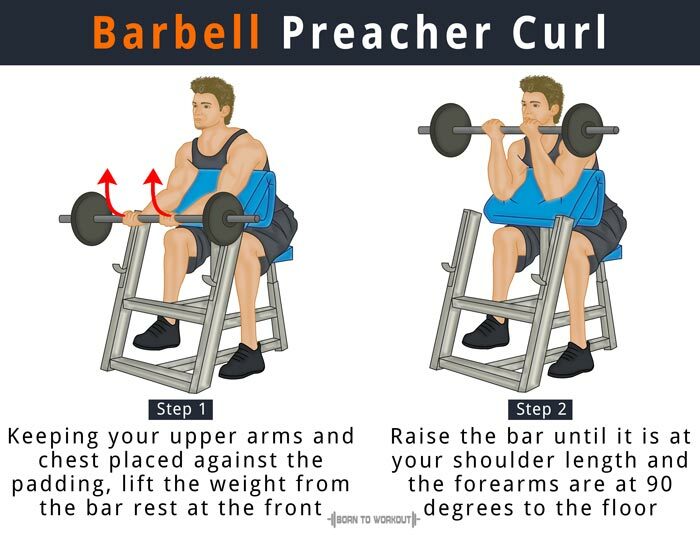 The preacher bench allows you to do the curl in the best manner possible. You can do high repetitions easily because, unlike the standing barbell curl, you do not need stability and movement of the full body. It gives you a better opportunity to focus on your form and function since it involves strict movement with less weight. Adjust the seat to make sure your upper arms can be comfortably placed on the pad while you are seated. Load the recommended weight on the bar. After sitting on the bench, grab the barbell with an underhand grip (palms facing up), and your hands kept shoulder-width apart. 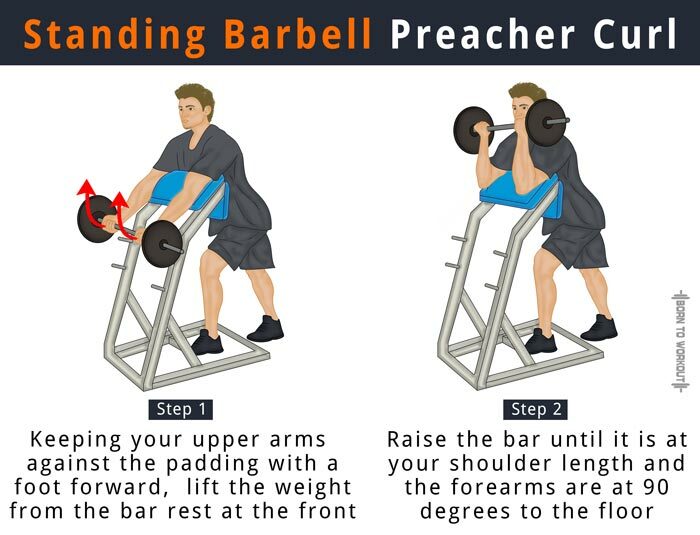 With your upper arms and chest placed against the padding, as well as your back kept straight, lift the weight from the bar rest provided at the front of the preacher bench. You should support the weight with your arms moderately bent. It is your starting position. Gradually raise the bar until it is at your shoulder length and the forearms are at 90 degrees to the floor. Squeeze your biceps and hold the position at the top of the movement for a second before lowering the barbell back to your initial position. Repeat the above steps for the desired amount of reps. The seated preacher curl can be modified by performing the movement in a standing position with one foot placed forward. Make sure you are positioned to rest your armpit at the top of the pad while your upper arm should always remain on the padding. Keep the elbows stationary and in line with the body. Perform the movements under control throughout the sets. You may have someone give you the bar if the preacher bench does not have any rack.